If you are concerned bout mold, give us a call to schedule a Mold Assessment! It is impossible to get rid of all mold and mold spores indoors. Some mold spores will be found floating through the air and in house dust. Mold spores will not grow if moisture is not present. Indoor mold growth can and should be prevented or controlled by controlling moisture indoors. If there is mold growth in your home, you must clean up the mold and fix the water problem. If you clean up the mold but don't fix the water problem, then, most likely, the mold problem will recur. Ultimately, this is a judgment call; there is no easy answer. If you have concerns or questions, be sure to ask us during your next scheduled inspection. Is sampling for mold needed? In most cases, if visible mold growth is present, sampling is unnecessary. Since no EPA or other federal limits have been set for mold or mold spores, sampling cannot be used to check a building's compliance with federal mold standards. Surface sampling may be useful to determine if an area has been adequately cleaned or remediated. Aerosol samples can do this as well as test the air to understand what you may be breathing. We are licensed to do both assessments. Buying a home? The process can be stressful. A home inspection is supposed to give you peace of mind, but often has the opposite effect. You will be asked to absorb a lot of information in a short time. This often includes a written report, a checklist, photographs, and what the inspector himself says during the inspection. All this, combined with the seller's disclosure and what you notice yourself, makes the experience even more overwhelming. What should you do? Here are a few contractors that we trust. We do not receive any fees from contractors. slurry beneath a sunken concrete slab in order to raise it back into place. Concrete sinks because its underlying support, for various reasons, gives way. The original concrete may have been installed on dirt that hadn’t been compacted sufficiently, for instance, or soil erosion may be responsible. And some soil simply settles naturally over many years. 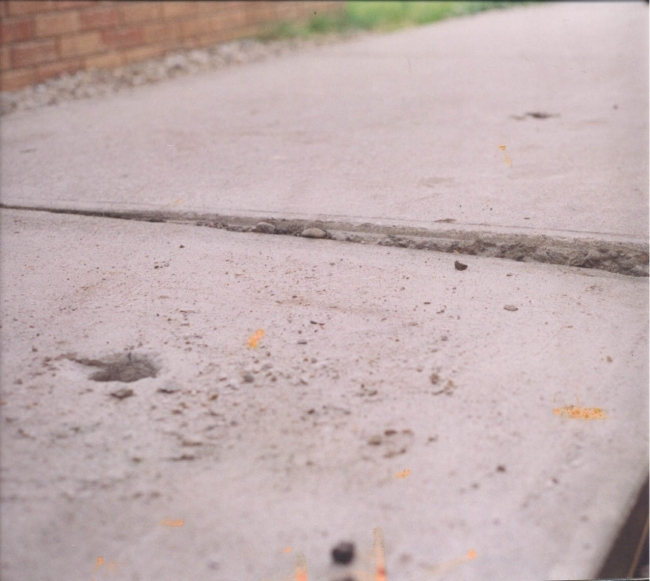 Regardless of the cause, sunken concrete can lead to many structural defects, including failed retaining walls, foundation settling, uneven junctions of concrete, sunken sidewalks, uneven concrete pads, cracked foundations, and bowed basement walls. If left uncorrected, these defects can lead to unwanted water runoff and major structural problems. 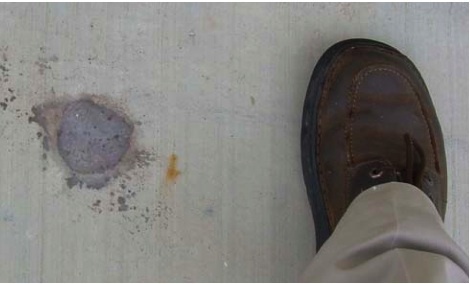 And, aside from the shabby appearance and decreased functionality of an uneven sidewalk, steps or walkway, sunken concrete can create major trip hazards for which the building owner is liable. If a building owner notices any of these conditions, they should consult with their InterNACHI inspector during their next scheduled inspection. First, small holes are drilled into the concrete, through which is pumped a slurry that may be composed of various materials, such as sand, cement, soil, limestone, bentonite clay, water or expanding polymers. The particular mixture is based on the type of application and the mudjacker’s preference. The slurry then fills any gaps and forces the concrete to rise back into place before the drilled holes are plugged up with cement, leaving the only visible evidence of the repair. Over the next day, the slurry solidifies and stabilizes the subsoil, making further sinking unlikely. While this is not a complicated procedure, it should be performed only by a trained professional, as amateur workmanship may cause even more extensive damage. Drain pipes, sewers and utilities must be located and avoided, and the area must be evaluated as to whether it can survive the mudjacking process. environmentally friendly. Mudjacking makes use of perfectly good concrete, which would otherwise be sent to a landfill. The concrete surface is spalling or otherwise damaged. The mudjacking process might further damage the surface, which will still be defective even after it’s raised back into place. The concrete has risen, caused by expansive soil. The only solution for this defect is to re-pour the cement. The cause of the settling is not addressed. If the soil has settled due to some external factor, the problem must be fixed or the soil will sink again in the future. For instance, a gutter downspout that drains onto a concrete edge must be corrected in order to avoid the need for future repair. The underlying soil is swampy. There is a sinkhole beneath the concrete. In summary, mudjacking is an inexpensive, fast and clean way to level a sunken concrete slab.